What do the 0 and 00 on the roulette machine mean? If you look closely at the roulette wheel you will notice that some roulette wheels have a single 0 and some have a 0 and a 00. Is one game better than the other? Does it matter which game you play? These are questions often asked by players who notice the difference, and for those players that never noticed the difference you will find out why you need to start paying better attention. It can have a huge effect on your wallet. There are two different roulette wheels. The European (Euro) wheel has a single 0 and the American wheel has both the 0 and 00. This doesn’t seem like much of a difference but it has a HUGE impact on the “house edge” (casino advantage). The American wheel has a house advantage of 5.26% which is not very good for the player. The Euro wheel basically cuts that advantage in half (2.7%) by simply removing the 00. 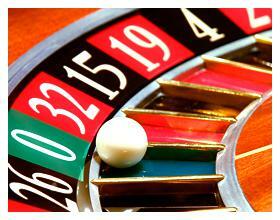 That means roulette players should always play the Euro wheel when available. If the 0 or 00 were not on the board it would take away the casino advantage. When a player bets red or black he thinks he is getting an even odds bet. He thinks he has a 50% chance of being right. If this was true the casino would not be profitable, there would be no built-in house advantage. That green spot or spots makes all the difference in the world and insures that the casino will be profitable in the long-run. In general, the odds of roulette are not very good for the player, but the biggest tip that can save you a lot of money is ALWAYS play on a wheel that only has one 0. Oh wow! I never knew the difference on single number made. Thank you!